Stucco and stone exterior with floor plan for today’s lifestyles. 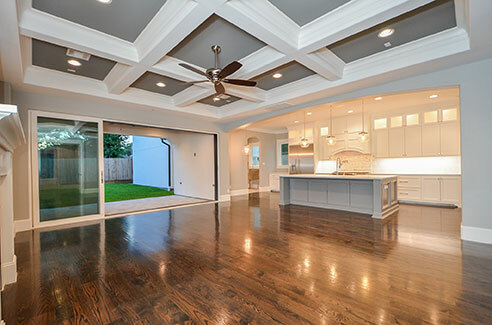 Grand entry, kitchen open to family room with sliding floor to ceiling window open to summer kitchen. Hardwoods throughout! Upgraded HVAC, Spray foam insulation, high end appliances, designer lighting package. All bedrooms up. Porte cochere passes through to two car detached garage with garage apartment – 6-8 cars can park on property. Covered back porch with summer kitchen. Room for pool – pool bath already in place. Fabulous central city location with excellent access to Energy Corridor, Memorial City, Galleria OR Downtown. Exemplary SBISD schools! © 2018 Advant Homes | Designed by Cornerstone Creativity Group LLC.